Long Beach Race Week 2017 was an absolute success with amazing breeze, comfortable warm temperatures, and lots of fun and exciting racing. Winds ranged between 10-24 knots all three days, keeping things interesting on all three race courses. Fourteen fleets raced either inside the breakwater or just outside the harbor. The kelp was a major factor for those racing inside, while those outside battled the swell, especially on Sunday. The weekend was full of fun, competition, carnage, parties, and a water taxi between Alamitos YC and Long Beach YC made sure no social gatherings were missed. West Coast sailors always look forward to LBRW. The close proximity of the open ocean and a large bay behind what has to be one of the world’s largest breakwaters makes for some prime sailing conditions for boats of all sizes. This year’s edition added extra excitement with four brand-new Pac 52s racing one design. The Pac 52 class is growing, and six boats are expected on the start line in September for San Francisco’s Big Boat Series. J/70 sailors had 28 boats, close to the same number at the World’s last September. 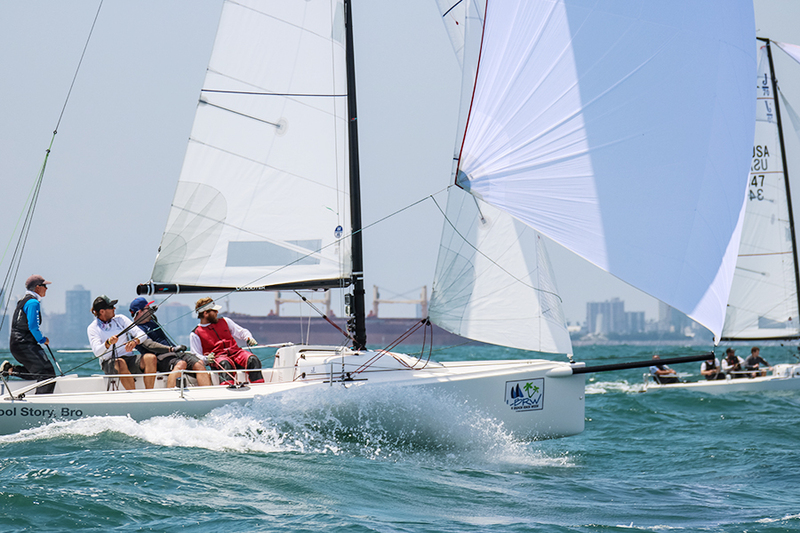 Winning crew on ‘Cool Story Bro’, led by North Sails Chris Snow, won the class and three 1st place finishes also earned them One Design Boat of the Week. The top Corinthian boat, Pat Toole’s ‘3 Big Dogs’, also used a full North Sails inventory. Conditions were very typical for Long Beach this time of year, with moderate southwest breeze each morning that increased and clocked right through late afternoon. The J/70 course inside the breakwall had a ‘washing machine’ effect that kept things challenging. With three days of racing, and no throw-outs, winning teams had to be on their game and completely focused. We set our forestay at 4’7″ of rake, 1/2″ longer than our tuning guide suggests. I was happy with this setting especially as the breeze came on. In general the J/70 has neutral helm due to its high aspect rudder. As the breeze builds and you drop the traveller and ease the mainsheet to keep the boat from heeling too much, the tendency is for the helm to get very light; so light that when you ease the main a lot in a puff, the bow of the boat will go away from the wind rather than towards it. Adding more rake helps the boat to luff up slightly in the puffs, which is much better for performance and VMG upwind. Below is the tuning guide we follow. Our base is 16 on the uppers and two full turns off the lowers after they are set to 15 on the PT-2 gauge. Remember that as you tighten your shrouds, you must also tighten the backstay. When it is breezy, the backstay bridle should be VERY tight so you can get extra leverage with the backstay adjuster. You can also shorten your backstay 2-3 feet to bring the apex of the bridle higher and get even more leverage. For sails we used the standard North XCS main, J2H jib and AP-1 spinnaker. These same sails were used by the team who won the Corinthian fleet. Thanks to Jim Murrell and the J/70 West Coast class for rallying for a great event.